Collerkin Granville James Coller M.D. Granville James Coller was listed as 17 in the 1870 Michigan census. He lived on the family farm in Newton Township, Calhoun County, Michigan. In the 1880 census Granville Coller was listed as 25. He was a student at: 6th Ward - University Home Oppartie Hospital, Ann Arbor, Washtenaw, Michigan. Granville first lived in Michigan. After medical school he moved to Brookings, Brookings County, South Dakota. From there he went to Los Angeles, California. Currell, Biddle Family Notes: Granville was a doctor, a Representative in the South Dakota State Legislature, and he served on the South Dakota Board of Regent for Higher Education. His life and record of service is included in the History of South Dakota. Granville J. Coller, M. D. Biography. This biography appears on pages 1799-1800 in "History of South Dakota" by Doane Robinson, Vol. II (1904). 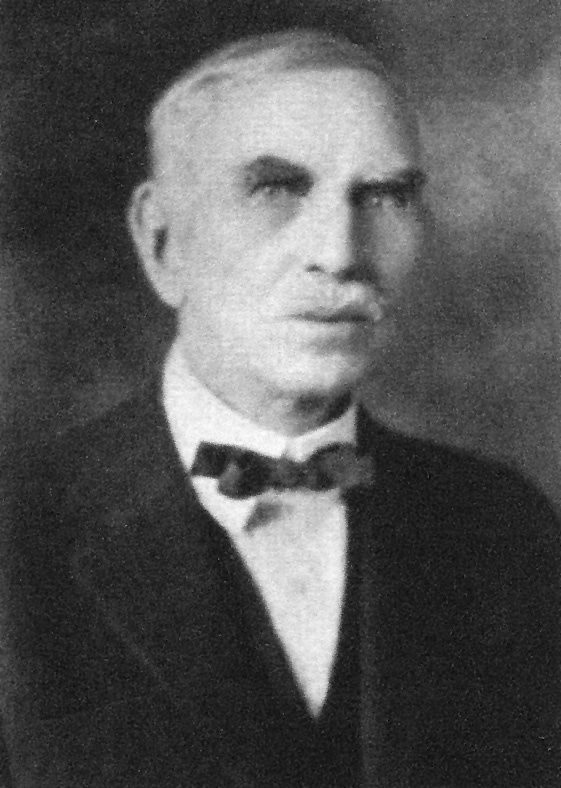 GRANVILLE J. COLLER, M. D., one of the pioneer physicians of Brookings, is a native of the state of Michigan, having been born on a farm in Lenawee county, on the 6th of November, 1854, and being a son of James L. and Amanda M. (Richart) Coller. James L. Coller was born in the state of New York, a son ,of Jesse B. Coller, who was of English lineage. When the father of our subject was a child he accompanied his parents on their removal to Michigan, which was then considered on the frontier, and the parents were numbered among the pioneers of the state. James L. was reared to manhood in Lenawee county and after his marriage he continued to be engaged in farming in that county for a few years, after which he removed to Calhoun county, where he continued in the same vocation until his death, which occurred in 1861. He was survived by his wife and their six children, the youngest being but one year of age, while the subject of this sketch was eight years old at the time when he was thus deprived of the care and guidance of his father. The family remained on the homestead farm, and much of the responsibility of carrying on the work devolved upon the youthful shoulders of our subject and his brother Edgar, the latter being at the time about eleven years of age. Here the devoted mother reared her children to years of maturity and here remained until 1899, when she came to Brookings and was made a welcome acquisition to the family circle of her son, the subject of this review, who accorded her the utmost filial solicitude until she was summoned to the life eternal, in October, 1901, at the venerable age of seventy-four years. Of the children we enter the following epitomized record: Sarah, who became the wife of Wheeler Collins, died of consumption, in 1901, at the home of the subject, whither she had come from her home in Colorado; Edgar, is a successful farmer living in Michigan; Lafayette continues to reside on the old homestead farm in that state; Granville J. is the immediate subject of this review; Chester is likewise a resident of Brookings; and William is engaged in farming in Michigan. Dr. Coller was reared to manhood in Calhoun county, Michigan, where he worked on the home farm until he had attained the age of eighteen years, while in the meanwhile he pursued his studies in the public schools during the winter months. At the age noted he was matriculated in Adrian College, at Adrian, Michigan, where he was a student for three years, in the meanwhile teaching one winter term of school, while after leaving the college he continued to follow the pedagogic profession for two years. At the age of twenty-one years he was elected superintendent of the township schools of his native county, rendering effective service, while it may be said that he has ever maintained a lively interest in the cause of popular education. In 1877 he entered the medical department of the University of Michigan, where he completed the prescribed course in the autumn of 1880, receiving the degree of Doctor of Medicine and coming forth well equipped for the work of his noble profession. Shortly after his graduation the Doctor came to Brookings, South Dakota, the town having at the time but three dwelling houses, while the business places were represented by a relative parity. When he arrived in his new field of labor he was five hundred dollars in debt, having utilized this amount in completing his technical education, and when he took up his residence in the embryonic town his cash capital was summed up in five dollars. He was, however, endowed with boundless energy, determination and pluck, and his pleasing personality and professional ability soon gained him appreciative recognition in the pioneer community. During nearly a quarter of a century of active practice here he has ever been faithful and self-abnegating and his name is deserving of an enduring entry on the roll of the honored pioneers of the medical profession in the state. He has continued a close student of his profession and has availed himself of post-graduate work, keeping abreast of the advances made in medical and surgical science. In the spring of 1900 Dr. Coller established a private hospital in Brookings, the same proving a success, but by reason of his own impaired health and the insistent demands of his outside professional work he was compelled to abandon the enterprise. The Doctor has been justly prospered in temporal affairs, he is a member of the State Medical Society, American Medical Association and American Association of Railway Surgeons. He is fraternally identified with the Independent Order of Odd Fellows and the Ancient Order of United Workmen. His religious views are in harmony with the tenets of the Presbyterian church, of which his family are members. In politics Dr. Coller has ever been a staunch advocate of the principles of the Republican party, in whose cause he has been an active worker. He was for three successive years incumbent of the office of mayor of Brookings, while his also was the distinction of having been chosen to represent his district in the senate of the first legislature of South Dakota after its admission to the Union. He has also served as a member of the board of regents of the State Agricultural College and is president of the board of health of Brookings county and has been at intervals for a number of years. On the 2d of October, 1884, was solemnized the marriage of Dr. Coller to Miss Helen Underwood, who was born in Calhoun county, Michigan, on the 8th of October, 1856, being a daughter of Amasa and Jane Underwood, both of whom were natives of the state of New York, whence they accompanied their parents to Michigan in their childhood days. Amasa Underwood was a son of Thaddeus and Phoebe Underwood, the agnatic line tracing back to English origin, while on the maternal side the lineage is of Scotch-Irish extraction. Mrs. Coller was graduated in the Chicago Ladies' Seminary, in the city of Chicago, as a member of the class of 1876, and was thereafter, for six years, a successful and popular teacher in the same institution. She is a member of the Degree of Honor and also of the Woman's Club of Brookings. To Dr. and Mrs. Coller have been born five children. concerning whom we incorporate a brief record: Frederick A. is a member of the class of 1906 in the State Agricultural College; Helen is attending the public schools; Granville C. died at the age of five years; Clara J. is attending the schools of her native city; and James died in infancy. Richart Family Notes: Granville's mother, Amanda, lived with Granville and his family. 1. Alt. Birth. Grandville's biography in "History of South Dakota" by Doane Robinson gives a birthdate of November 6, 1854. 2. 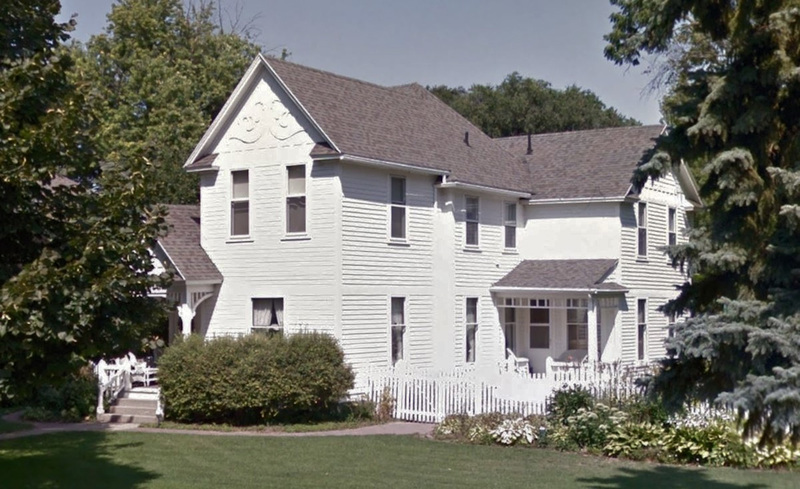 Residence: Fourth Street, 1885, Brookings, Brookings County, South Dakota. This is Granville Coller's second home at this location on Forth Street in Brookings, South Dakota. It was built in 1891. He built his first home here in 1885. 3. 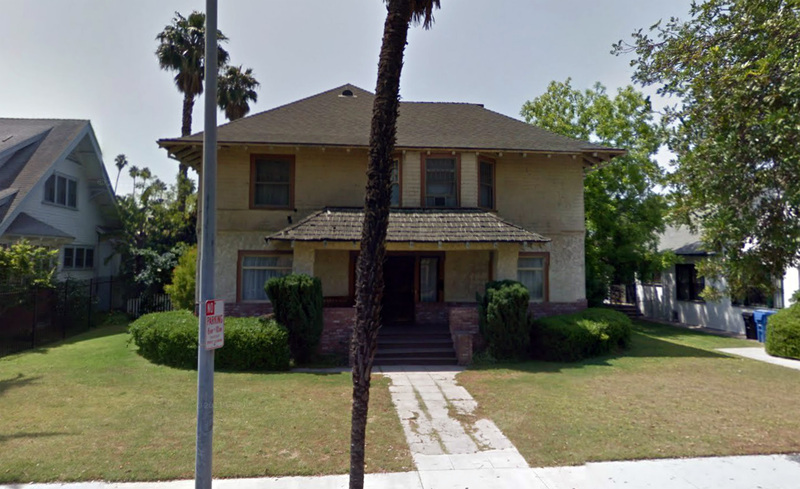 Residence: 2336 West 23rd Street, 1939, Los Angeles, California. 4. Residence: Fourth Street, 2015, Brookings, Brookings County, South Dakota. 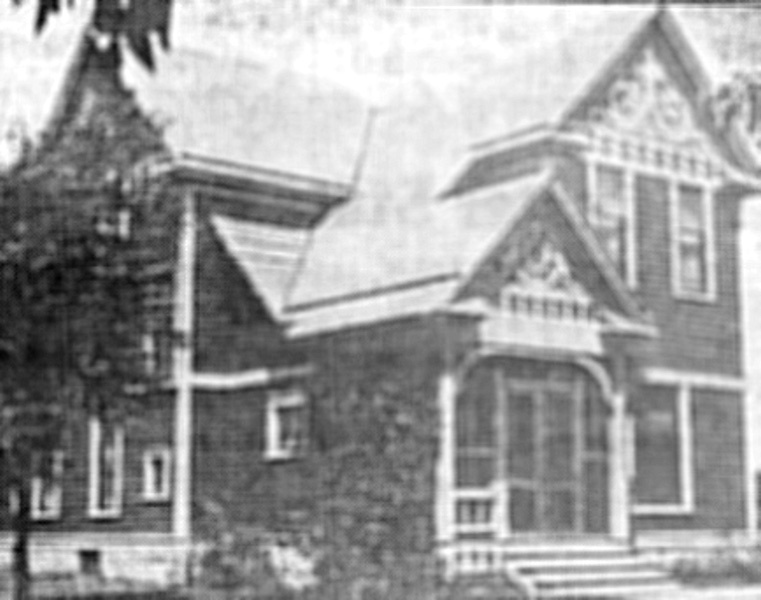 This is a 2015 picture of the home Granville built in 1891. I matched it using architectural detail. I believe the street address to be 716.